The Bridge Program is a highly successful, grades 6-12, immersion program at Wooster which provides coordinated services to students with language-based learning disabilities. The program is designed to allow these students to fully engage in a secondary school experience designed to maximize the development of their many strengths while fully supporting them in those areas which are impacted by their learning challenges. 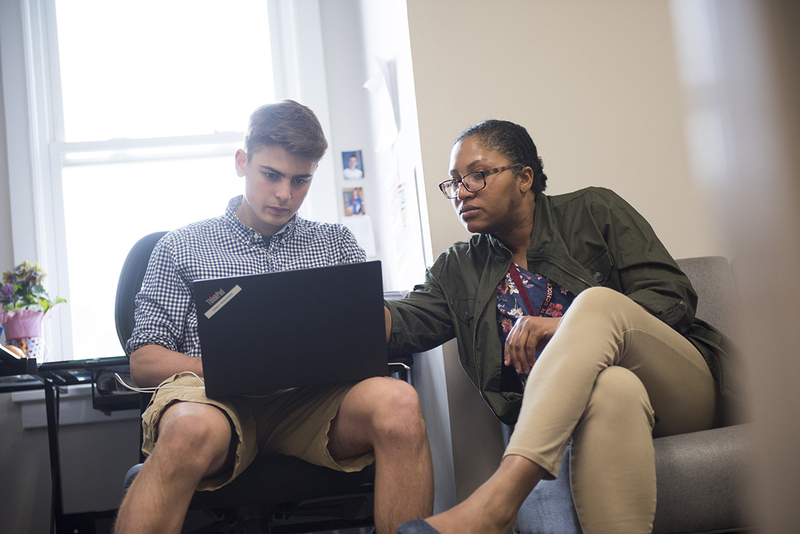 The program leverages Wooster School’s commitment to building independence and agency in its students, and fully prepares its Bridge students for college matriculation and a life of learning. A number of our current Bridge Program students have entered the program from Windward School, The Southport School, Eagle Hill School, and other mainstream public and independent school environments. To date, all of our Bridge graduates are attending, and thriving, at competitive four-year colleges. The Wooster Bridge Program provides the perfect balance of academic support and a rigorous college preparatory experience. It is important to emphasize that Bridge students are Wooster students first, so all are also expected to be active, thoughtful members of our community who have the qualities of kindness, compassion, and resilience that we expect in all of our students. Wooster School believes that all students have what is called a “jagged” learning profile. Each student has strengths, weaknesses, and gaps in his/her learning. Each student has different passions and interests. Each student has a slightly different learning trajectory given a particular concept or skill. When you plot all of these different points on a graph, and factor in the context of the learning environment and each student’s personal circumstances, what you see are peaks and valleys, hence, a “jagged” profile. There are no “typical” students at Wooster School -- each is unique. So, the only difference between a non-Bridge student and a Bridge student is the likelihood that the Bridge student’s valleys, or challenges, are likely to be tied to their learning disability. That said, our Bridge students peak in all sorts of ways -- in math and science, in the arts, athletics, leadership, etc. -- just like our non-Bridge students.